This review is written by Dante Mathis. I’ve recently taken a break from my beloved Nintendo 64 platform to cover a more classic, timeless, and more well known game, which I’ve had my fair share of experiences in the past with. The Legend of Zelda, for lack of a better word, is Nintendo’s Lord of the Rings, a story of epic scale hinged on the betterment of a world we will never understand. When I was thirteen, I first encountered the golden cartridge that had shaped a million childhoods at a flea market, unknowing that the dungeons in the game can be accessed randomly, in nearly any order you choose. While I, young as I was and without as stable of an internet connection as I have now, managed the first two dungeons well enough, and in the proper order, my lack of experience quickly pulled me to dungeon five, without warning. So difficult was my trial, and so little my youthful patience, I abandoned the game after half a dozen attempts, and made a self aware tape to myself in the future. While I never found the tape, the memory of it set fire in my stomach, and I was compelled to finally beat that which had hardened my young fingertips to calluses. So, with a better walk through in hand, and beyond half a decade of conquered video games under the belt, I recently decided to crack open the golden seal one final time, with the express intend of adding it to the collection. What followed was the unmitigated redemption of my young soul, and one of the ultimate separations from my childhood self. I highly doubt I need to explain the game play therein, but for those who, for one reason or another aren’t familiar, the basic rundown is a hodgepodge of elements within the action, adventure, and role-playing genres of games, played on a flipped-screen overhead perspective which relies on grid like movement when traveling from area to area. You control Link, on a powerful and harrowing journey to defeat Ganon, the Prince of Darkness, and save the land of Hyrule. Though you begin your quest with little equipment, and a basic three hearts, through the exploration of the land you’ll quickly be presented with your first arsenal: A wooden sword, bombs, and a lantern for all your arson based desires. Yet, this is not all: This first phase of game play is nominally refereed to by some as “The Gathering.” Which, by the end of our fruitful journey, will yield us: Three additional hearts for our health bar, bombs, a fresh and improved sword, a magic shield, arrows and medicine, and a blue ring to reduce the damage we take, along with giving Link a grayish tint to his dressings. Now, with our starting arsenal, we are ready to plunge headstrong into our first trilogy of dungeons, and ready to bring our path closer to Ganon. 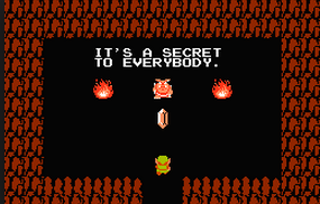 A borderline necessity, various secret areas can lead to money pits which greatly reduce the need to grind for Rupees in the wilderness. Link, under our own guidance, will find himself braving the Dungeons of the Eagle, Moon, and Manji. Our hero braves his first foes, which would be cemented as future goblins in the Hyrule underbelly. His bow wrestled from the claws of Aquamentis the Dragon, and his magical boomerang yielded up from the irate yet ignorant Dadongos, and the raft from the fierce some and carnivorous Manhandla plant. When the dust settles, our hero finds himself better equipped for his journey, and with an additional three hearts to boast. Yet, these treasures almost all are necessities, not luxuries, and only allow you complete dungeons, rather than make them easier. Though things certainly won’t be as hard had we not committed our start to gathering provisions rather than plunge forward in haste. In our second cycle of three dungeons to plunder, among the lairs of Snake, Lizard, and Dragon, we’re introduced to the villain which struck me down in my youth, and hindered my progress until I took up the game nearly a decade later: Wizzrobes. These bewitching devils have only a small window to attack before they teleport elsewhere in the room, which is coupled with their straight forward projectile attacks which span the length of the chamber. When many exist in one space, it demands an incessant amount of attention to assure Link isn’t in the line of fire by any of the mythical creatures. Yet, pressing forward beyond a visibly more difficult portion of dungeons, we’ll be rewarded with new provisions: the stepladder, whistle, and magic wand yielded up from another fierce Dragon, a dangerous floating eyeball, and Gohma the spider Queen. With our journey in the homestretch, Link gathers bait for his future venture, before plunging into the dungeon of The Demon, ominous as it may seem, this is the Paradiso of our Divine Comedy, the ultimate ascension to our journey’s conclusion. The Fairy ponds: Where my thirteen year old self found the fortitude time and time again to press onward. Beyond the Demon’s Dungeon, Link will battle once more with Aquamentis, before recovering a magic book from within the Dungeon of Lion, and if you have a good walk through, the Magic Key, an ever present and nearly vital instrument for the storming and inevitable destruction of Ganon. Finally, we lead Link into the entrance of Death Mountain, where we still have several treasures to gather in the destruction of such a dark foe. 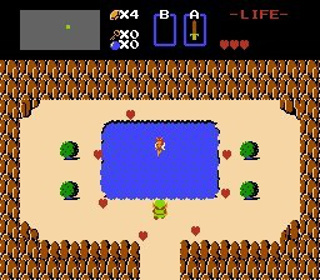 The silver arrow, the vital weapon to pierce Ganon’s darkened heart, and the Red Ring, which will defend Link even further than the blue ring previously garnered. With your Magic Key, not even the bolted barricades within Death Mountain will impede your vengeance upon Ganon. The battle is brief, yet with a challenge unexpected as Ganon pitches himself back and forwards across his lair, leaving the player a limited number of arrows to hinder him for further attacks. Though anticlimactic in some regards, it’s inevitably exhilarating when turning the Prince of Darkness to ash, only to bring Zelda out of her bonds, and liberate Hyrule from the Tyranny they very nearly were bound to for generations. So what’s the verdict? The game is an utter masterpiece, certainly regarded as one of the absolute best ever made. It spawned a franchise which clung to some more thoroughly in their childhoods than Mario or Sonic ever could, and this is one I have every intention of passing on to whoever I’m able. The title is apt; The Legend of Zelda is a legendary epic which unfolds before your eyes, even with walk through in hand, and the most minimal of thought process involved while playing, the sheer action of fighting enemies and collecting rubies supplements those who find the often cryptic over world too much of a challenge, though I still found enjoyment in putting down the walk through for the dungeons and trying my own mind at the puzzles presented, which are often easier than I’ve made it out to be. I doubt I need to tell anyone this by this point in time, but if you’ve yet to complete the original Legend of Zelda, then I would recommend it highly, and even consider it a necessary addition to any gamers resume.